Happy Friday! I hope you've had a great week! Mine has honestly felt so super long and I am really looking forward to recharging with some relaxation this weekend. Today, I'm sharing my weekly roundup of what I'm currently loving. 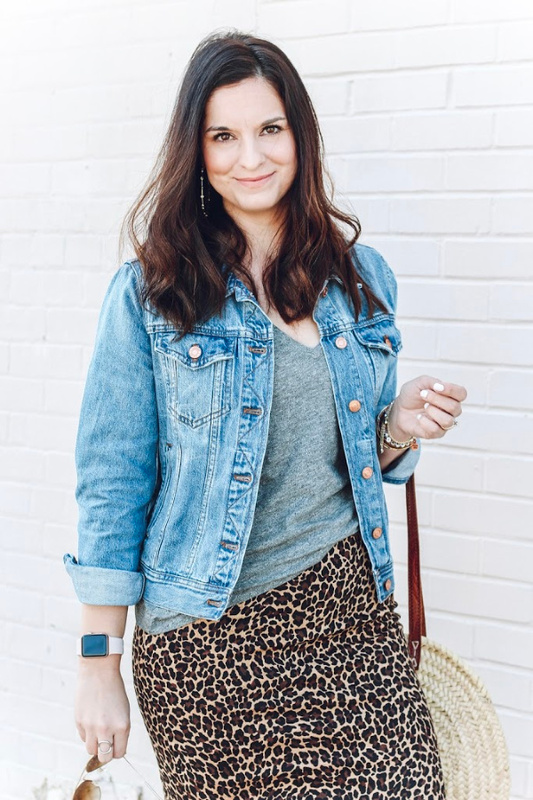 I'm sharing lots of great items that you can wear now and they will also transition perfectly into spring! 1. B O W | How cute is this bow?! I love this leopard print. It would be adorable with a top knot or ponytail now and into springtime! 2. S T R I P E D T O P | I'm a firm believer that you can't have too many black and white striped tops in your closet. They are definitely a staple! I also really love the fit of this one. Under $15! 3. S N E A K E R S | Rose gold sneakers?! Yes, please! These shoes would take a basic jeans and tee outfit and make it so much more fun. 4. P U L L O V E R | I saw this pullover in the store last weekend and it's such great quality. So super soft and I love the pink! 5. J E A N S | If you haven't tried Abercrombie for denim, you're missing out! They are such quality for the price and I love the fit, especially the high rise. I bought a more distressed version of this pair last summer and I love them! I stuck with my regular size because it's true denim and they break in so well. I would highly recommend them! 6. N E C K L A C E | This necklace is darling! I love anything heart shaped and this locket opens up with a mirror inside. It's also currently on sale! 7. S C A R F | I love tying a scarf in my hair or on my bag. It makes old outfits feel brand new! 8. T O T E B A G | A tan tote bag is definitely a staple in my wardrobe. This budget friendly option is season less and it would go with everything!